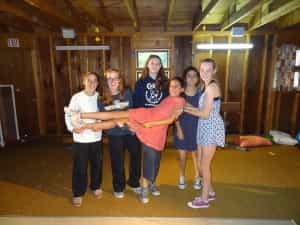 Camp Woodland | Hairbrushes and High School Musical make for a FUN day! Hairbrushes and High School Musical make for a FUN day! 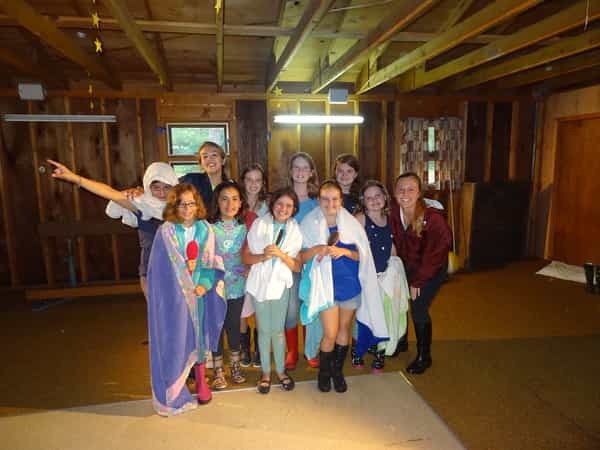 In case you didn’t know, it never rains at Camp Woodland for Girls! We just get a little (or a lot) of “dew” as the case was on Monday. 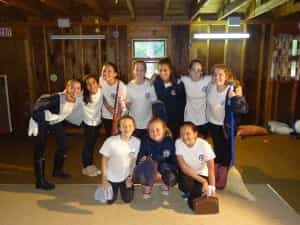 Woodland Girls do not let a little gray weather dampen our spirits…the “show must go on”! One of the most highly anticipated rainy day activities is the ever popular Lip Sync Contest. 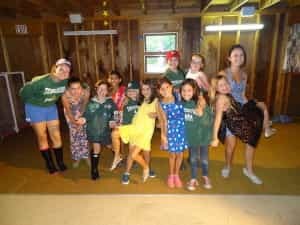 I can remember dry summers when we actually got to the 4th or 5th week of camp and the campers were praying for a “dewey” day just so that they could have the Lip Sync Contest! High School Musical was popular for song selections by several cabins for this year’s contest. Both Driftwood and Sunnyside performed a number to one of HSM’s hit tunes. Lip Sync Contest is the perfect cabin bonding activity. With the help of their counselors, campers negotiate which song will be chosen for the performance, and then they must come together to decide on costumes, props, and dance moves. It is not unusual to see hairbrushes used as microphones and other interesting items appear such as a broom and dustpan. As you can see from the smiling faces in each picture, the annual Lip Sync Contest is a ton of FUN! Because Monday was a “dewey” day all around, the afternoon was spent doing another favorite cabin activity called the “Human Treasure Hunt”. Cabins rack up points in a number of categories, and the cool thing is that the more diverse a group is, the more points they can earn. For example, campers with half, step, or adopted siblings add bonus points to their team. First year campers and anyone born outside of the USA also contribute extra points. Having a dog for a pet is awesome, but it only gets counted once towards the total score even if there are 12 dogs in the group. If someone has an iguana or other unique animal for a pet, then the score increases. Human Treasure Hunt is a really awesome way to learn about your cabinmates and appreciate each person’s contributions to the group as a whole. p.s. The sun came back out on Tuesday, and it has been “business as usual” ever since. Another gorgeous week in the Northwoods!